Even if you’ve found your wedding dress and signed on the dotted line to officially make it yours, you still aren’t ready to head down the aisle quite yet. Most gowns need some sort of alteration, and the scope of work can vary greatly, depending on where you purchase your gown and how many changes need to be made. With the help of a seamstress or tailor, you’ll be ready for your wedding day with a gown that fits flawlessly. It’s important to time your alterations right. Bring your gown in too early and you might not end up with a proper fit. 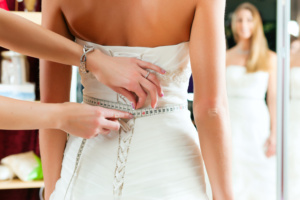 (You may lose or gain weight after your gown is altered, which could affect the dress’s overall look and fit.) Bring your gown in too late, and you run the risk of not allowing enough time to have all the changes made. We recommend allowing around two months from your first fitting to your last as an ideal timeline to make all the alterations. Also keep in mind that the amount of times you need to go for fittings depends on how much you’re getting done to the gown—on average, most brides go for three or four fittings. When you’re ready for alterations, don’t just bring your gown—take your undergarments, shoes and accessories to your fittings as well. With all of the pieces in place, it’ll be easier to envision your overall wedding day look. Your undergarments and shoes will ensure the proper fit and length of your gown, and your hair accessories or veil will help you maintain the right overall balance. If you don’t have the exact shoe you’ll be wearing, bring something similar in height. While you might have legions of bridesmaids, it’s not a good idea to bring them all to your fittings, but you’ll definitely want someone to come with you. Consider inviting your mom, another trusted relative or friend to accompany you to your fittings for their reliable opinion and another set of eyes. And because your maid of honor will need to know how to do the bustle, it’s a good idea to bring her to your last fitting so she can learn how your gown works from the pro. Whether you found your gown at a couture salon or a bridal sample sale, the options for alterations are nearly endless. We’ve worked on bridal gowns are used to reworking fabrics, opening up hems and can practically redesign a dress. This is particularly common when a bride wants to modernize her mother’s gown—our seamstress or tailor can use the same fabric but create an updated style for the gown. Choosing a style is only the first step on the path to scoring your dream dress. From first fitting to final, here’s what to expect — and what’s expected of you — during the next few months. Decide which accessories — jewelry, headpiece, wrap, bag — you want to wear with your dress and buy or order them. Buy your undergarments and bridal shoes. You must have your wedding day lingerie and shoes for all your fittings — a simple bra switch or change in heel height can cause your dress to fit improperly. 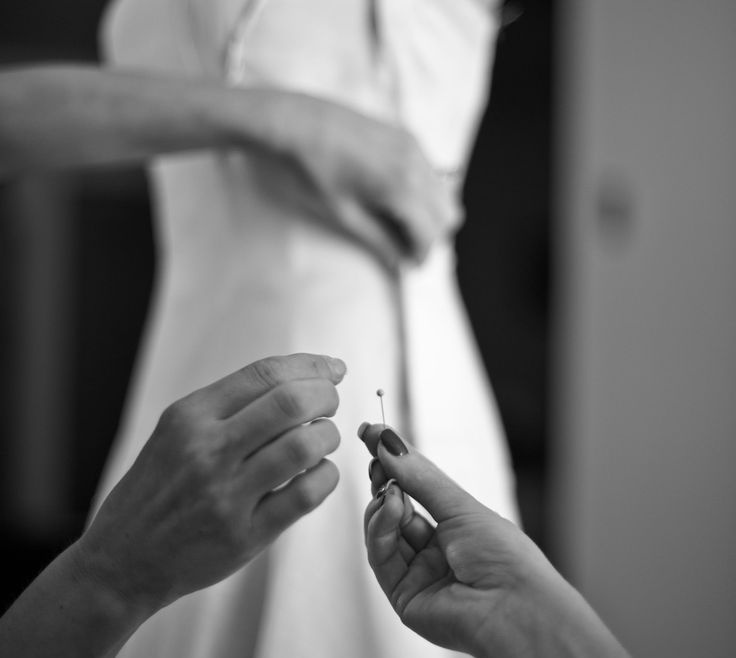 The first fitting usually takes place about six weeks before your wedding day. Just like when you were shopping, it helps to bring one eagle-eyed friend or family member along for advice. And don’t forget your shoes, bra, and slip — along with any other accessories you have purchased — so you can see how everything looks together. That we’re on the same page as what you envision for your dress. We will then begin looking for places where your dress needs to be taken in, let out, shortened, lengthened or altered — hence the term “fitting”. While we’re busy fitting your gown, take a close look at the way the material falls and notice how the waist feels, how the chest area fits, etc. Is there any funny puckering, bunching or bulging? Look closely at the stitching, embroidery, or beading. Does everything seem well-sewn? Speak up if you see anything that you don’t like — or forever hold your peace. This is your time to be demanding, so give into any bridezilla impulses. Our tailor will be able to tell you why each problem exists, and what can be done to fix it. Of course, don’t expect miracles. This is why trying on the sample gown was so important: You should have had an idea of what you were going to get. But you are also paying big bucks for this gown, and it is your prerogative to have as many fittings as it takes to get the perfect fit. On that note, don’t forget to schedule your next fitting before you leave the store. About a month before your wedding, you should have a second fitting. Again, bring along your foundation garments, bridal shoes, jewelry and any accessories you plan to wear on your big day. And if you’re deciding between a few different sets of accessories, make sure to remember to take pictures with your phone so you can see how each option looks with your dress. Once again, speak up if you see something that doesn’t look right. If there is a problem, continue to schedule fittings until you are completely satisfied. When the day of your final fitting arrives, ask your mom and maid of honor to come along so they can learn about your gown. Does it need bustling? Ask the salesperson to teach them how to do it. Does it have complicated straps or buttons? Make sure they learn how to work them before the big day. Also, now’s the time to find out how to get rid of last-minute wrinkles. Should you use an iron? On what setting? Is steaming a better option? And what if you spill something on the gown? Are there certain products you should/shouldn’t use? Knot Note: Store some talcum powder, baby wipes, chalk and Q-tips in your bridal bag for quick fix-ups. When your final fitting is complete, schedule a date and time at least two weeks before your wedding to pick up your gown. When that day arrives, try your gown on one last time, especially if it’s been a while since your last fitting. We all know the ways stress affects our appetites, and if you’re suddenly too skinny for your gown you’ll have time to adjust it, or your diet.